For Sentimental Sundays post, click HERE. Helllllooo friends! It's time for another challenge at Lia Stampz and this time it's 3 R's! Here is my very CAS card. Isn't he cute?! I like him, too fun :) The deadline for this challenge is November 15th. You DON'T have to use a LiaStampz image (can be any stamp/digi stamp/ embellishment-not even an image). There is nothing much to explain here. The self adhesive gems on top right are Pie Lane. I am feeling a bit better today, will stop by your blogs real soon... till then happy crafting! Hello everyone! I hope you guys are doing good. I am sorry for not visiting your blogs, I am still not well enough. I was asked by Calypso of Sentimental Sundays to join their team, I wasn't this ill when I said yes and now I think I wouldnt be able to do justice to their challenges. 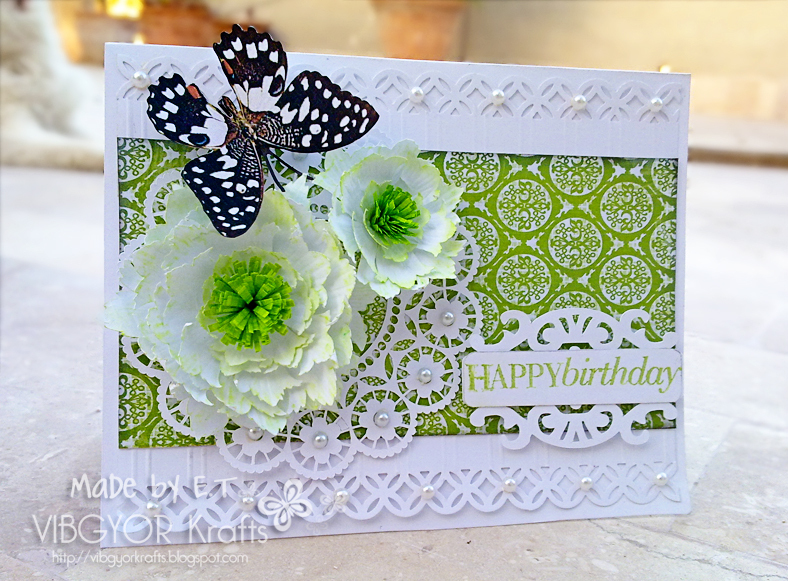 The challenge this week is "Birth Flowers", I made this card well in advance otherwise I would have to skip my first post. You can use your birth flower or just get inspired by them. 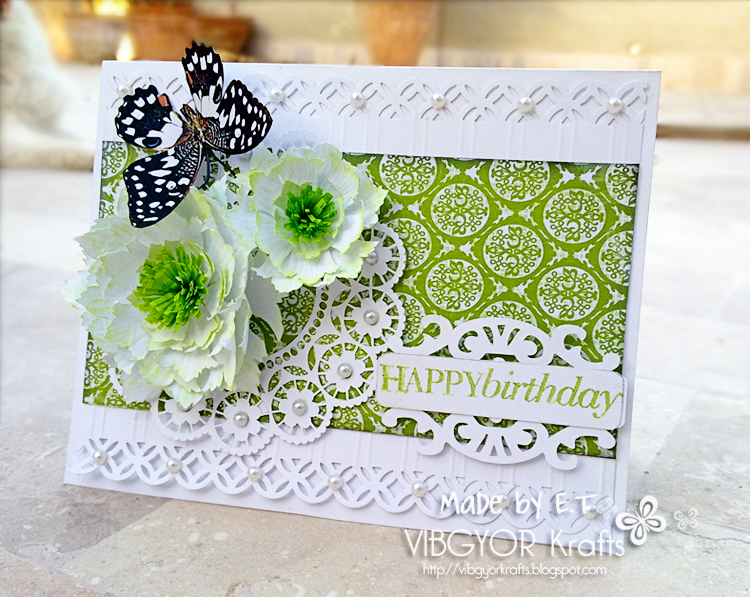 I took inspiration from my birth flower (lily of the valley), and used the colours white and green for my card. This is one of the cards that was sent to Tejal on her birthday. 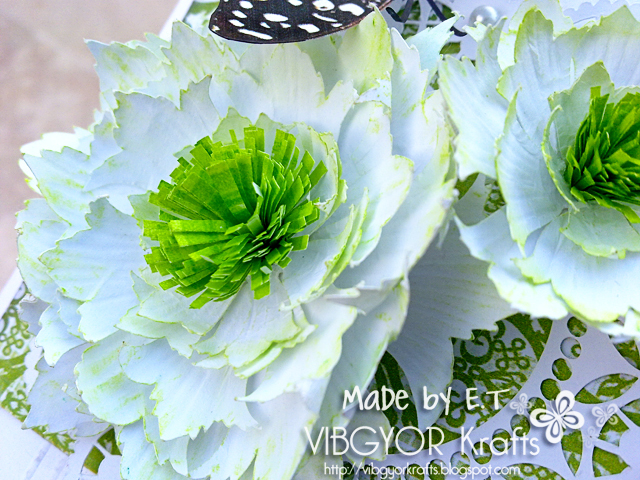 The flowers are handmade, you can find the template for the white ones at Mel's blog. The center is a simple fringe flower coloured with Crayola markers. I am sorry I thought I will be able to handle a detailed post but I am still not well. Here are some detail shots, I hope you will get the idea. The PP and butterfly are both digi prints. The frame is Silhouette cut and sentiment is HA. The doily is also Silhouette cut. I hope you can see the scoring below the PP. I am 9 hours late to this hop. Didn't have power here. It is Tejal's birthday, one of my very very good friends here in crafty world. She is one of the most honest people I have found here and you can go to her with anything and everything, she will help you out no matter what! This birthday hop is organized because she deserves all things happy and good. Happy Birthday Tejal! Here is a sneak peek of what I made for you! 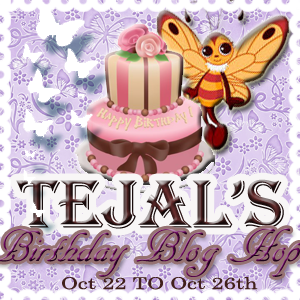 Hop along with us and dont forget to wish Tejal a very happy birthday! Hello friends! This is one quick and to the point post. Bloody migraine. I am guest designing today at FYI. Stephanie of FYI sent me a gorgeous inspiration picture (shown below), I was so drawn to it and I knew what I had to do. All the flowers, except for the little ones, are handmade. This was made way before the migraine started so you can see I have put in quite a lot of work in this. You can see the yellow-gold paint spatters and copper glitter balls (Pie Lane) here. This was part of a candy I won at Trina’s blog. I added few chunky glitters (Pie Lane). Added faux stitching around the top embossed layer. Applied a bit of pearl paint to glam these flowers a bit more. Finished it off with a fancy bow and button. I have started my homeopathic meds for the migraine. I hope it gets better soon. Hello everyone! Today I bring to you GingerLoft’s challenge and the theme this fortnight is “Halloween”. You can create anything you like as long as it fits the theme, you don’t have to use a digi image to enter. For this challenge I made a tag which can also be used as a door hanger. This scalloped shape is a new one I drew, the scallops are more circular on this one. I have tried to give the scalloped part a glossy look. The image is called Pumpkin Scene, I have shown the pumpkins as rotten and stinky. Can you see the green smudges outside the image? I made those by applying Inchworm Green Crayola marker on my finger tip, misting it and then thumping on a spare CS first (once only and lightly) and then on the image. I have created a black gooey glitter mess with hot glue gun and black glitter, placed some punched glittered leaves on it. The image is coloured with Faber Castell’s regular pencils and Crayola markers and is ink-distressed with Clearsnap (colorbox queue - Black). Looking for Pie Lane post? Click HERE to visit the Pie Lane blog. Hello friends! 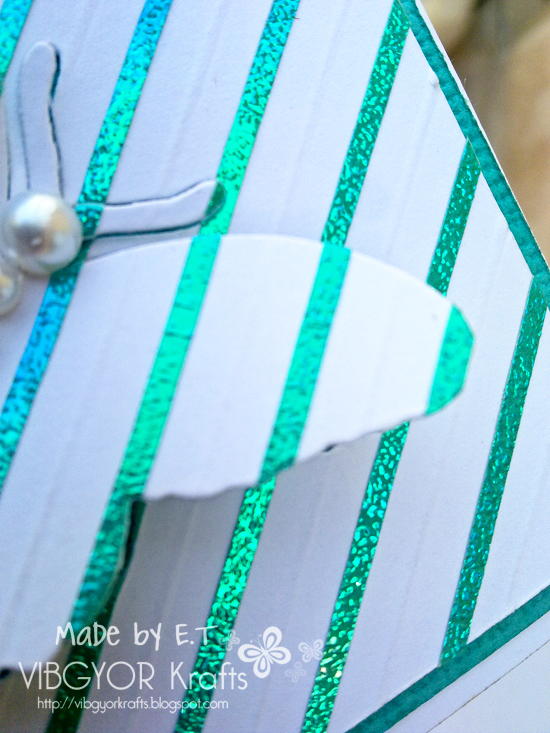 Today I have to show you a card, a tag and a not-so-fancy bird house! I was asked to guest design at DYSU, the challenge this week is “Use your Scraps”. Here is the first of my three creations. All the PPs you see here are digi freebies. I tried to match a few pattern papers in my scrap box and I think these go well together. For the sky I used, Clearsnap (Colorboxcat eye queues – french blue). The birdies are from Just some lines and are coloured with regular Faber Castell’s . I added a bit of sparkle to them. The super cool red glittery sticker heart, purple glitter balls and jumbo chunky glitter is from Pie Lane. A matching tag! I love this tag! SO NEAT! The sentiment is handwritten. 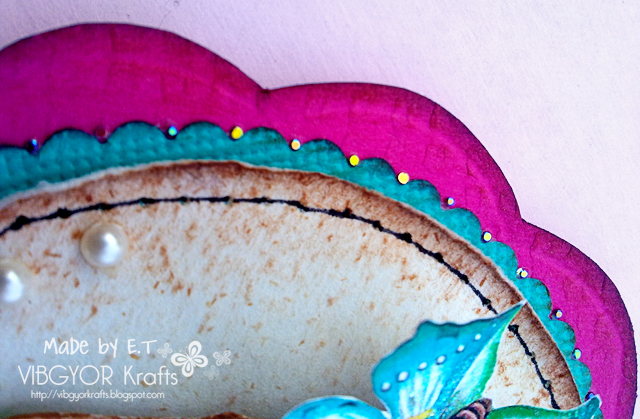 The thin yellow strip running behind the scalloped circle is a Pie Lane border sticker. It is totally fabulous to spice up your project! I think I should have added one more parallel strip. This bird house is made from scratch, I didn't use any template for it and I don't remember the measurements! LOL You can see the uneven hole? Awesome no?! haha I have used fabric dyes to colour the CS; originally Kraft. The roof panels have been cut with fancy small-scallop scissors. 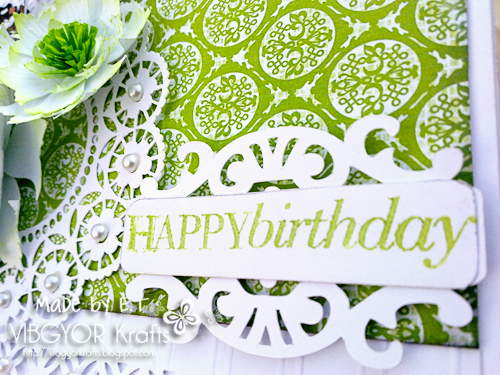 The walls are embossed with sizzix texture plate – distressed. The roof panels are also embossed and the roof looks kinda tiled because I used a checkered texture plate. Hope you like these. I like the tag THE BEST. Some of you asked which cell phone do I use to take pictures, its Nokia N97. Yes! We have a Pie Lane blog now and a brand spanking new Pie Lane DT. 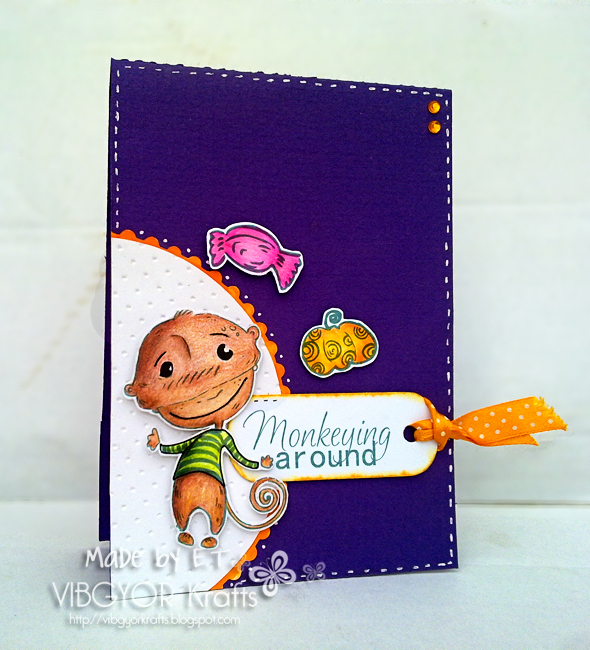 I have a card to show you today over at Pie Lane blog HERE. See you at Pie Lane! Hello everyone, I have been away because I am not well. I will stop by your blogs soon. 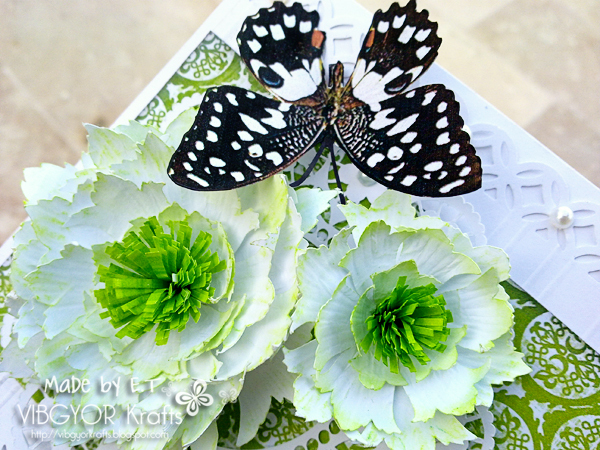 Last week one of my cards was featured at the Catered Crop blog. I was invited by Linda to be a “Guest Chef”, so I had to make a card based on the recipe of my featured creation. I used the heart and frame from the last card… LITERALLY, took it off from the featured card… What!?! I am not well, I can do that. The scallop shape is traced from a template. I finally saved a template so I do not have to draw scallops every time from scratch. The gorgeous yellow paper is from Ujjwal’s store – Handmade with Love. The flower is handmade. Sentiment by HA, flourish by Inkadinkadoo. Frame is a Silhouette cut. The yellow gems and copper glitter balls from Pie Lane. Hi everyone! Sorry I have not been visiting your blogs to comment. I will stop by soon. This fortnight Tami of GingerLoft is challenging you to use the colour ORANGE! I have two cards to show you today. 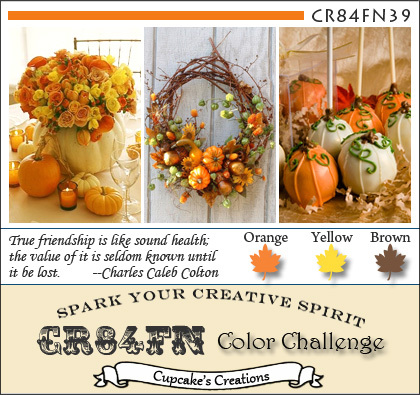 I have used the “Pumpkin Sign” digi from GingerLoft Store. The image is coloured with regular Faber Castell pencils. All the papers used here are digi freebies. The scallops are hand cut and adorned with copper glitter balls by Pie Lane. The butterfly and fabulous diamond gem stickers are also from Pie Lane. The image’s edge is distressed by Clearsnap (French Blue - queue). I added faux stitching and distressed the papers with Archival Ink in Sepia, I like how this makes the paper look a bit like fabric. The beaded trim is from my stash. I finished it off with a fancy bow and an orange gem button. The second card was not so much orange, this is why I made the card shown above. This image is called “Swing on a Star” . I have used the complete set here with the sentiment. The paper used here is also a digi freebie. I used yellow gel pen on the moon to give it bit of a sparkle. That’s it for today folks. Please note that you DONT have to use a digi in order to play for GingerLoft challenges. You just have to follow the theme.